"Being With God is an exceedingly important and well-written book on Orthodox theology of the Trinity. It not only explains the work of two major contemporary Orthodox theologians; it also lends vital insight into the nature and character of contemporary Orthodox theology in general." "This is a splendid work of hard-won insights into crucial figures in the development of contemporary theology. Aristotle Papanikolaou makes an original contribution that will be of great interest not only to students in the area of Eastern Orthodox theology but to anyone studying Christian anthropology, metaphysics, trinitarian thought, or comparative theological method." 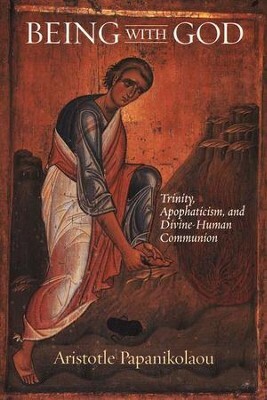 The central task of Being With God is an analysis of the relation between apophaticism, trinitarian theology, and divine-human communion through a critical comparison of the trinitarian theologies of the Eastern Orthodox theologians Vladimir Lossky (190358) and John Zizioulas (1931 ), arguably two of the most influential Orthodox theologians of the past century. These two theologians identify as the heart and center of all theological discourse the realism of divine-human communion, which is often understood in terms of the familiar Orthodox concept of theosis, or divinization. The Incarnation, according to Lossky and Zizioulas, is the event of a real divine-human communion that is made accessible to all; God has become human so that all may participate fully in the divine life. Aristotle Papanikolaou shows how an ontology of divine-human communion is at the center of both Lossky's and Zizioulas's theological projects. He also shows how, for both theologians, this core belief is used as a self-identifying marker against "Western" theologies. Papanikolaou maintains, however, that Lossky and Zizioulas hold profoundly different views on how to conceptualize God as the Trinity. Their key difference is over the use of apophaticism in theology in general and especially the relation of apophaticism to the doctrine of the Trinity. For Lossky, apophaticism is the central precondition for a trinitarian theology; for Zizioulas, apophaticism has a much more restricted role in theological discourse, and the God experienced in the eucharist is not the God beyond being but the immanent life of the trinitarian God. Papanikolaou provides readers with a richer understanding of contemporary Orthodox theology through his analysis of the consensus and debate between two leading Orthodox theologians. The author is assistant professor of theology at Fordham University. I'm the author/artist and I want to review Being with God: Trinity, Apophaticism, and Divine-Human Communion.